you are right, Remmy Ongala was never with OK Jazz. Adam Seye Kadimoke, however, was a member of OK Jazz during the 1970s. It looks like it's the same versions, with a "warmer" sound, but less songs. @ Peter: thanks for this info! @ Matt: I have a cassette too, credited to "Rammy" (which I suppose is closer to his real name) Ongala and orch. 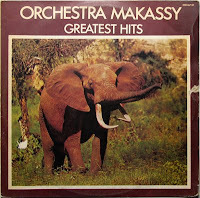 Makassy, with 2 of the tracks replaced by 2 of Remmy's compositions. The sound is very similar to this album. Ah yes, that's the one. Nice blog. Thanks for this album. Thanks a million for this rare music. I've been searching far and wide for the full version of "Molema" and I only found it here. Thank you! Merci! Danke! Baie Danke! Grazie Mille! Ni muvea muno! Asante Sana! Matondi mingi! I tried to download this album but got an error message. What to do? Great album indeed, thank you! @Rascal: Unfortunately I can't reproduce the black screen you are getting. I have no problem downloading the file. I know that some browser settings may block the use of the download function of Adrive. Have you tried downloading in another browser? If nothing works, send me an email via the address in my profile.